Robotics is on a high growth trajectory within both industrial and consumer sectors. The fifth generation (5G) of wireless technology will provide the communications and bandwidth necessary to allow various industries to leverage the next phase of robotics evolution. Enterprise users will capitalize upon new and enhanced robotics capabilities to enable new use cases and improved work flow. Many business processes will change as enterprise becomes more savvy about the flexibility of robotics uninhibited by bandwidth constraints. 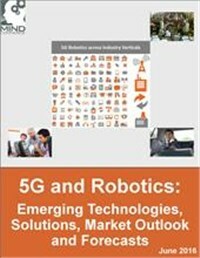 This research assesses the impact of 5G on robotics industry including industry verticals and leading vendors. The report evaluates the impact of artificial intelligence on robotics combined with 5G. The report analyzes emerging areas and those enhanced by 5G such as remote operation and cognition as a service respectively. This report includes forecasts for 5G enabled autonomous robots on global and regional basis.